The College of Physicians of Philadelphia Digital Library | Hühnermensch, or “Chicken man." In 1735, in a small town near Leipzig, Germany, 28-year-old Johanna Sophia Schmeid delivered a stillborn baby, her fourth child. 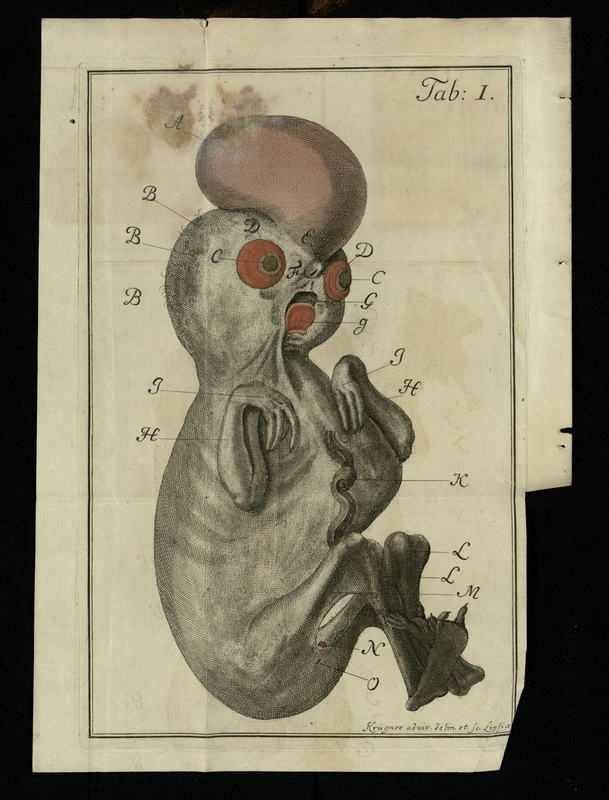 This baby was born with numerous physical anomalies, including a comb-like structure on the head; large, round eyes; and hands with lengthy fingers and “claws exactly like those of a chicken.” A local physician, Gottlieb Friderici (1693 – 1742), performed an autopsy and published his findings in the essay, Monstrorum humanum rarissimum, or The rarest of human monsters (1737). The essay included detailed anatomical drawings, such as this one, and a proto-case study of the pregnancy. “Hühnermensch, or “Chicken man. ",” The College of Physicians of Philadelphia Digital Library, accessed April 23, 2019, https://www.cppdigitallibrary.org/items/show/7036.